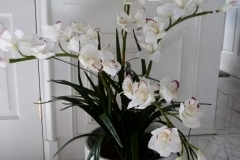 Artificial plants and silk plantscapes are long lasting. 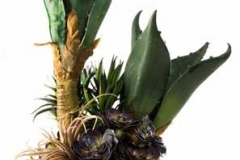 At Make Be-Leaves we specialize in working together with interior designers to over come faux foliage challenges, customizing our life-like creations to fit your specifications, to perfectly complement and accent your design elements. First impressions are lasting. 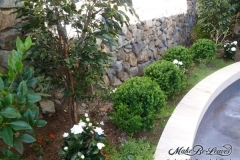 We partner with interior and exterior landscape architects and designers to provide a range of services from simple landscape designs to complete themed artificial plantscapes and faux floral plants and trees – specializing in custom creation and turn-key installation services. Is it real? …or Make Be-Leaves! 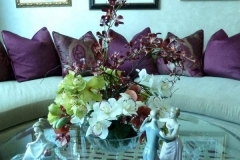 Let us help you bring the beauty of nature into your next design project with beautiful custom silk plants, silk flowers and majestic silk trees. 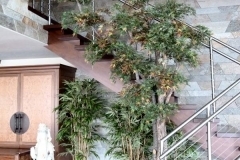 These custom 14 ft. silk Ficus Trees were constructed for the new Earl’s Court a very prestigious upscale food court, right in the heart of the financial district (two blocks from Ground Zero) in Manhattan. One of the design challenges on this project was the very shallow space of the custom built elevated planters for the trees - with only eleven inch depth for the tree potting. is a vibrant, fun office setting with a Disneyland Main Street theme We provided a mix of custom silk trees, including silk Camellia Leaf Trees, silk Red Japanese Maple Trees, silk Weeping Willow Trees, and silk Yellow Birch Trees in the main Towne Center. Plus colorful Silk floral plantings though-out the complex. 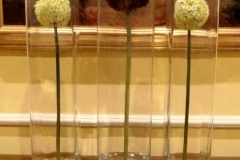 These striking silk single stem allium balls in the tall glass enclosed vases will never need to be dusted or cleaned, makeing their beauty ever-lasting and maintainence free. Make Be-Leaves created a variety of sleek, contemporary silk floral arrangements for the Ameristar Chicago suites, that feature clean lines and low maintanence. Make Be-Leaves just shipped off a completely full 53 ft. truck container full of silk trees and silk plants– headed for the new multi-million dollar Vocus headquarters located in Maryland, just north of Washington D.C. This was a very exciting project! Make Be-Leaves installed these magnificent custom silk Japanese Maple Trees in a stunning residence in Oxnard California. Working closely with the owners and their interior designer, Lisa Morosco, the Silk Japanese Maple trees, Silk Bamboo plantings and Silk Kenicia Palms were custom built to detailed specifications. Merced Fruit Barn Store in Merced, CA. 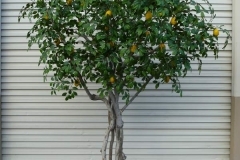 A recent project of Make Be-Leaves involved constructing custom artificial Lemon trees and Orange trees for the Merced Fruit Barn Store in Merced, CA. As you can see from these photos, large custom artificial trees can be an important accessory item to the overall design of a space – adding warmth, ambience and style to the room. 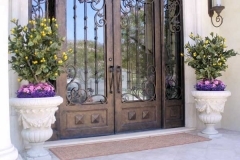 Make Be-Leaves has worked with interior designer, Roy Sklarin, for over 25 years. It has been such a privilege during these years to work with Roy on some of the most incredible estates in the country. 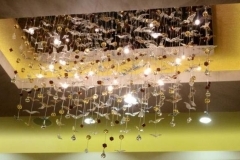 Make Be-Leaves has worked with interior designer, Paul Darrall of Darrall Design Consultants, for many years. Paul specializes in hotel design – and is truly a leader in cutting edge design. 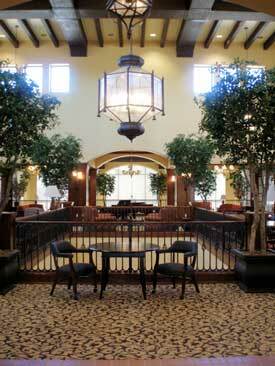 Make Be-Leaves installed custom silk trees and silk plants for the Marriott Long Beach Hotel. 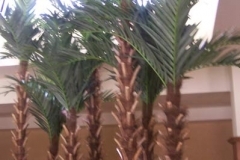 Make Be-Leaves installed custom artificial trees, silk plants and silk orchids for the Seacrest Senior Living Facility in Poway, CA. 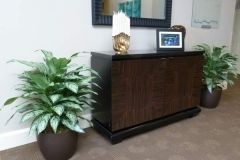 The design firm, Interspec, specified custom 3 ft. Chinese Evergreen plants to flank both sides of the console table in the main entrance lobby. Make Be-Leaves worked closely with homeowner, Debra Burg, to create a specially designed custom silk Red Japanese Maple Tree for their master bedroom to replace their previous headboard. 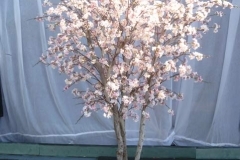 Make Be-Leaves custom constructed two 8 ft. tall Custom Silk Cherry Blossom Trees, the silk trees are made with delicate, multi-hued pink silk cherry blossom foliage. Make Be-Leaves recently installed Custom Silk Trees, Silk Floral Arrangements, and Silk Plants in this Beautiful Newport Beach residence. 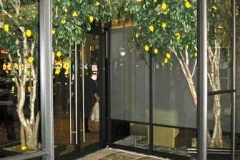 These Silk Lemon trees flank each side of the entrance to the Italian Restaurant at the prestigious Borgata Casino, located in Atlantic City. 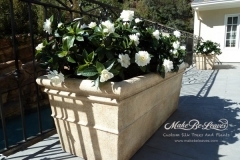 Make Be-Leaves recently designed a custom artificial plantscape for a magnificent Beverly Hills estate. 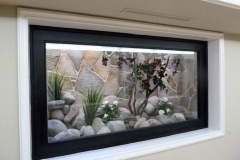 It was a unique interior situation - a front window-framed planter area, open at the top to the outdoors, with a water feature gently cascading down the back stone wall. Embassy Suites Hotel, Valencia Ca. 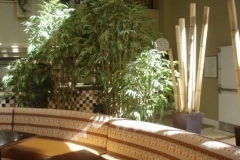 Embassy Suites Hotel, located in Valencia is a great upscale property. The striking contemporary interior was designed by Joanna Lee of CPD Design firm, located in Boca Raton, FL. Camp Pendleton Marine Corp Base - Carlsbad, CA. Make Be-Leaves has been working with several interior design companies, on many on-going projects throughout the base. 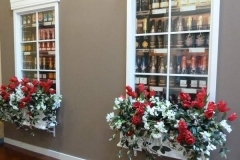 Silk plantscapes include a variety of custom silk trees, plants and floral arrangements, custom designed per specifications of the interior designers. Make Be-Leaves recently installed custom trees, florals and plantings at the upscale Morningside of Fullerton Senior Living community. The installations involved two separate design firms, Cole Martinez Curtis in Marina del Rey, and Interspec in Del Mar – each company designing different areas of the property. 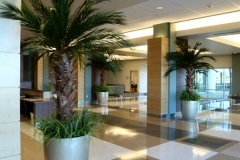 Make Be-Leaves created these custom preserved Palm Trees for the prestigious, new Palmdale Regional Hospital. 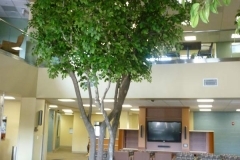 The design staff emphasized that it was critical for the trees to be incredibly life-like, while making a dramatic effect in their sleek, contemporary main lobbies. Make Be-Leaves was contacted by the owner of the Marriott Hotel in Times Square regarding their prestigious Sky Room Lounge – the largest roof top lounge in Manhattan. 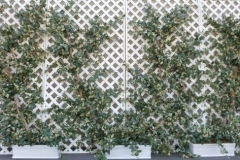 Though these plants are fully protected from the outdoor weather, direct sun required the plants to have UV protection. The entire project was produced, shipped and installed within several weeks, and within the client’s budget. 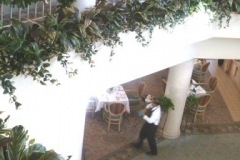 Make Be-Leaves has worked on interior plantscaping for senior living facilities throughout the country – including the prestigious La Costa Glen and University Village in California. Huntington Hospital Breast Center, located in Pasadena, CA. 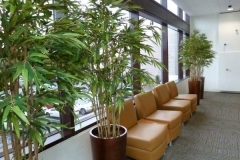 These custom plantings of tall, sleek silk bamboo were recently installed in the Huntington Hospital Breast Center, located in Pasadena, CA. - The challenge was a very shallow planter depth. 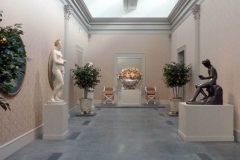 For the grand opening of LACMA\'s new building, The New Resnick Pavilion, Make Be-Leaves provided this beautiful custom tea stained, grand focal floral arrangement for one of the rooms in the Eye For The Sensual exhibition in the building. UV Stabilized Topiary, Trees and Plants. 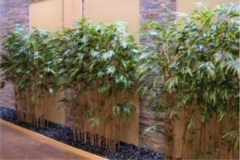 The large planters along the walls are a mix of a few live plants. 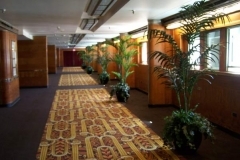 J/Brice Design International, Inc., hospitality-industry design leader renovating the iconic HMS Queen Mary, appointed Make Be-Leaves as plantscape specialist. 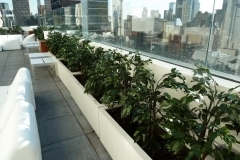 This installation of Silk UV Outdoor Plantings was for a residential upper balcony, where watering & maintenance of live plantings had become burdensome. The Custom Silk plants and floral arrangements along with the Silk Oak Trees and Silk Olive Trees were created by the artisans at Make Be-Leaves to coordinate beautifully with the live Oak and Olive trees throughout the grounds. MAKE A GRAND ENTRANCE ! 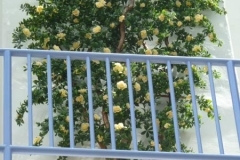 This Make Be-Leaves featured installation is at a beautiful Tuscan-style villa located in Valencia, CA, Featuring Custom Silk Loquat fruit trees and 14 ft. Custom Silk Olive Trees. Our artificial succulent plants, custom succulent arrangements and artificial cactus are so incredibly life-like - even to the touch. Call Make Be-Leaves today for your free design quote. 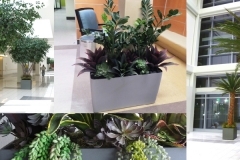 Interior and Exterior artificial plant design consultations are free. Just email: Susie@Makebeleaves.com me for more information.